This yarn in this photograph has been discontinued. I have made suggestions using Red Heart’s With Love to help you pick up colours. There is a combination of 6 colours being used in this throw. You can try using Red Heart With Love to gain the same look and feel. The repeat of the pattern is every other line. Each circle you see is a combination of 2 lines together. One line is the under side of the circle and the next line is the over side. I say this because if you want to have solid colour circles, then you may be interested to know where to change colours to acheive this look. To help you, I will post below a close up of the edging to show you how clean the edge really is. When counting circles, there is a total of 43 circles seen from top to bottom. The final circle is the same as the starting row to bring consistency to the look. The repeat of the colouring of circles appears 7 times. You can substitute colours and yarn to match your own colouring ideas. You can use more colours or less. Choice is up to you. You will need 1 balls of each of the 6 colours. Red Heart With Love 7 oz or 198 g.
This has multiple sets of 10. There are 8 sets of 10 stitches in this pattern. If you want a larger or smaller mat, reduce the stitch sets or add more stitch sets. At the end of the desired length of chain, add 3 extra chains. Pattern below is for the identical version for what is seen in this picture. 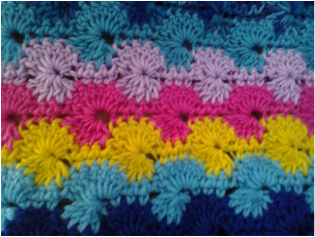 You can use this pattern for a throw, afghan or any other creative idea you may have. Change colours as you want to. --2. CH 1, SC in stitch 2nd from hook, SC in next. *SKIP 2 stitches, 7 DC into the next stitch. SKIP 2 Stitches, 1 SC into the next three stitches, Repeat from *. Very End of line will finish with only 2 SC’s in a row and not three. Turn. --3. If desired, this is where you would change your colour to ensure the circles stay the same colours if desired. If pulling off the same effect you see in my pictures, don’t worry about it and carry on. of the next three stitches (where SC’s are in the line under it). 7 DC’s into the centre of the circle in the line below. Repeat from * all the way across. Finish the final partial circle with 4 DC’s into the centre of the partial circle on the end. Turn. --6. If desired, this is where you change the colour again if wanting solid colour circles. --7. CH 1, 1 SC into the first two stitches. *CH 3, CL the next 7 Stitches Together, CH 2, 1 SC into each of the next three Stitches. Rpeat from *. Final will end with only 2 single crochets in a row to match the starting side. --8. Repeat lines 2 – 7. There will be a total of 43 circles shown after finishing the borders. --9. 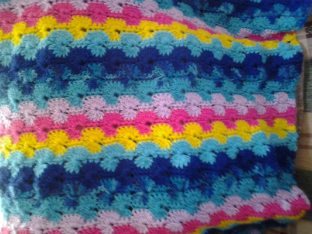 I repeated the final circle of the afghan to be the same colour as the starting row to bring consistency. Choice is yours. --1. The starting row is flat where the final row you finished with will be a full circle. sides will have a nice circling affect on the top and bottom borders. --3. I didn’t do this for the side borders due to the many colours running down the sides. The circles would look mismatched.